I've been kept by rodent-y types for over two years now, and I finally feel confident enough to put up some stuff about these amazing furries, to further their nefarious plot to take over the world. And ya know, I wouldn't mind if they did--I quite enjoy being a rodent slave--the way they entice you to cater to their every whim is well worth it. I wouldn't change things here for the world. They're happy--I'm happy--what more could any of us ask for? Well, stiffer punishment for animal cruelty crimes would be an excellent start. Okay, so the world needs a little adjusting, but then that's why the rodent-y guys are taking it over--no one would dare mess with a freshly awakened hamster, or a puffed up hissing rat, now, would they? (And if they did they'd only do it once.) Trust me on that one. Here you will find out who cohabits with us, and their predecessors--including short bio's, photos, a little care information, a smudge of history, tidbits, and other stuff you need to know, and a lot of crap you don't. 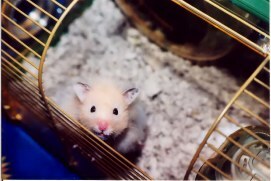 NB: Rats, mice, and other "pocket" or "exotic" pets are not cheap in the long run, nor are they disposable because the original purchase price was small. They are for life (their lives--as are all creatures) they deserve respect, love, health care and a rich, rewarding existence. If you can't be bothered with any of that, you don't deserve a companion of any kind. Period. The fact that other nations of creatures are bought and sold as "stock" irks me, but the world was like this when I got here. I try not to do more damage than is already done, and maybe undo a little along the way. I won't actually buy animals anymore, But I am more than happy to pay an adoption fee for an unwanted animal. The money goes towards the rescue or shelter, and not into corporate profits. Sometimes I'm forced to give my business to stores that sell "pocket pets," but on the whole, if I can get it at a store that doesn't sell creatures (Pet Value, for instance) I'd much prefer do that. "Until there are none, adopt one." This site is created in memory of Billie-kitty, Hickie-mouse, The Button and Boomer.